For a casually elegant getup, opt for a light blue coat and black velvet skinny pants — these two items go really great together. When it comes to shoes, this ensemble is finished off wonderfully with black leather loafers. If you're on the hunt for a casual yet chic ensemble, opt for a Jil Sander Navy string tie coat from farfetch.com and a black embroidered mini skirt. Both items are totally comfy and will look fabulous together. Kick up the cool of your outfit by rounding it off with black suede over the knee boots. If you're scouting for a casual yet chic getup, go for a Jil Sander Navy string tie coat and white skinny jeans. Both pieces are totally comfy and will look fabulous paired together. 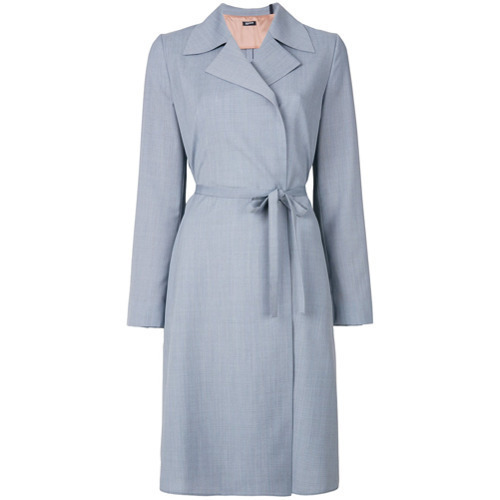 When it comes to shoes, this outfit is round off nicely with beige suede ankle boots. If you're on the lookout for a casual yet chic look, try teaming a Jil Sander Navy string tie coat with blue ripped skinny jeans. Both pieces are totally comfy and will look fabulous paired together. Wearing a pair of grey suede ankle boots is a simple way to add extra flair to your look. This combination of a Jil Sander Navy string tie coat from farfetch.com and blue ripped jeans is very easy to create and so comfortable to sport all day long as well! Bump up the cool of your getup by complementing it with silver leather heeled sandals. If you're searching for a casual yet stylish outfit, opt for a Jil Sander Navy string tie coat and black skinny jeans. Both items are totally comfy and will look fabulous paired together. If you're obsessed with functionality dressing when it comes to your personal style, you'll love this stylish pairing of a light blue coat and light blue ripped boyfriend jeans. Rock a pair of white heeled sandals to take things up a notch. This pairing of a Jil Sander Navy string tie coat and light blue boyfriend jeans is effortless, totally stylish and super easy to imitate! To bring out the fun side of you, finish off your getup with white low top sneakers. 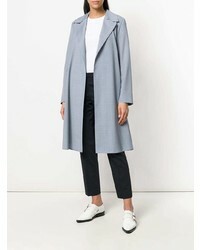 If you're hunting for a casual yet totally chic outfit, rock a Jil Sander Navy string tie coat from farfetch.com with black leather leggings. Both garments are totally comfy and will look fabulous together. When it comes to shoes, this ensemble pairs nicely with white and black check slip-on sneakers.